Richard Rezac, Untitled (09-03), 2009, Cherry wood and aluminum, 19.5 x 20.5 x 3.25 inches. Rhona Hoffman Gallery is pleased to present an exhibition of new work by sculptor Richard Rezac for his third solo exhibition at the gallery. For this exhibition, Rezac presents sculptures that are asymmetrical and which contain more delicate elements than his previous work, such as dyed silk and cherry wood. 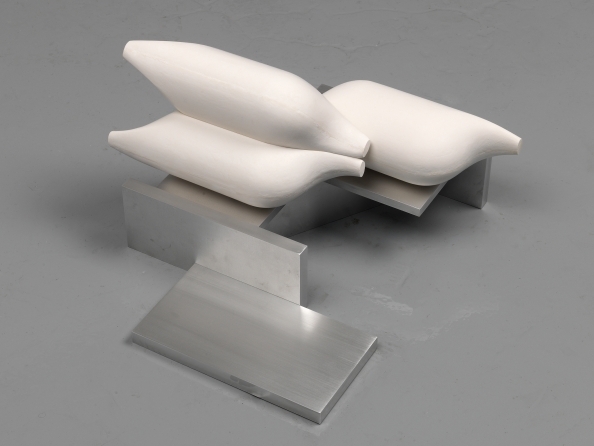 Rezac states that this combination “lends a somewhat more gestural or visually circulating sense, especially since many are oriented on the diagonal.” Rezac’s choice of aluminum, present in 7 of the 10 sculptures, engages a perceptual complication, sometimes doubling the form touching it, sometimes acting like a sheet of glass. Only one sculpture, "Aesop", is titled. In this work Rezac references an ancient Roman portrait, which he saw in Rome in 2007. The portrait was thought to depict a mythical author, and the forms within the sculpture serve to echo this Roman work. All other sculptures are left untitled in order to suggest a more open-ended, explorative and formal intent. Additionally, all of Rezac’s sculptures are derived from pencil and colored-pencil drawings. The sculptures are then directly made by casting, carving and assembling, incorporating bronze, aluminum, hydrocal, wood and silk. Richard Rezac lives and works in Chicago, Illinois . His work has been exhibited nationally and internationally. In 2006 he was awarded the Rome Prize Fellowship from the American Academy in Rome. He received the prestigious Joan Mitchell Foundation Grant in 2004. A ten-year survey of his work at the Portland Art Museum was exhibited in 2006. His work has been included in exhibitions at the Art Institute of Chicago, the Museum of Contemporary Art, Chicago, the Yale University Art Gallery, New Haven CT., the Aspen Art Museum, Aspen, CO, and the Chicago Cultural Center, among others. Richard Rezac is currently an Adjunct Professor of Sculpture, Drawing, and Graduate Advising at The School of the Art Institute of Chicago.